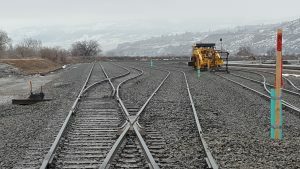 KAMLOOPS, BC, April 27, 2017 – Cando Rail Services has officially opened its rail terminal in Kamloops, BC. It will begin serving customers on site as the company expands its services into British Columbia. Phase 1 included building new track which will be used primarily for storage of empty railcars but bigger plans for the site continue to develop including transloading, railcar repair, and track and engineering services. The company has hired railway operating personnel for the terminal and additional hiring will be based on contracts and customer demand. The site will also serve as a base from which Cando can serve and support rail operations for customers throughout BC. “We expect our Kamloops operation to grow and evolve over time. It’s the perfect location for our BC headquarters situated close to major ports and connected to the rest of Canada,” said Cornick. Cando is the largest independent railcar storage and staging company in Canada, with more than 3,000 car spots in strategically located yards and sidings across Canada.